In the first of his new weekly columns for The42, Jonny Holland talks about his love of sport and fitness. Over the next 12 weeks, Jonny Holland will be one of three leaders — including Cork ladies footballer and Ireland International Saoirse Noonan and The42′s own Ryan Bailey — taking part in our Follow Fitness series supported by Avonmore Protein Milk. While Jonny will focus on nutrition, Saoirse will look at combining multiple top-level sports and Ryan will train for his first triathlon. If you’ve any questions for our leaders, be sure to use the comments section and you can sign up to follow one, two or all three leaders here. IT TAKES SOME getting used to, retirement. It’s the simple things like not telling people that you’re a rugby player any more. The strange part is that you don’t even realise you’ve retired for the first nine months. Even now, the whole thing feels a bit surreal. But I’m getting ahead of myself a bit and there’s not really much point in starting in the middle. Before I was a rugby player and now a nutrition and fitness consultant, I was just a young lad from Cork mad into sports. It was soccer, it was football and, of course, rugby. But it might surprise some of you that the other two took priority in the early years. I played soccer and rugby from about the age of five and Gaelic football from eight. I even dabbled in tennis up until the end of primary school as well as other bits and pieces but it was really the big three I focused on. I took soccer — I played with Greenwood FC — more seriously up until 14 or 15. In fact, I was nearly skipping rugby matches for the soccer matches some years. I played on a few Kennedy Cup teams at U13 and with Cork at U14 but, after that, soccer kind of fizzled out as I wasn’t really going anywhere with it. We — I say we because myself and my brother were triplets with my sister and played on the same teams growing up — would have won a couple of county titles in the football with St. Finbarr’s and that took a bit of time obviously. Once I got to college though, I knew rugby was the sport for me and I dropped everything else at that stage. To be honest, I probably always knew it would be rugby because I needed something a bit more physical, even though I wasn’t so big, I had a little bit of a temper. After playing with Sunday’s Well and Cork Con, the Munster Academy was something of a safety net because I knew I was on a pathway to something. It felt safe, a bit of a security blanket, but the coaches would always encourage you to take the next step too. It was 2013 when I made my debut with the Munster senior side, coming on as a sub in a game against Cardiff. I didn’t actually touch the ball in either of my first two appearances and the lads gave me an awful slagging. When I finally did get it into my hands, it was to kick it to touch to end a game. 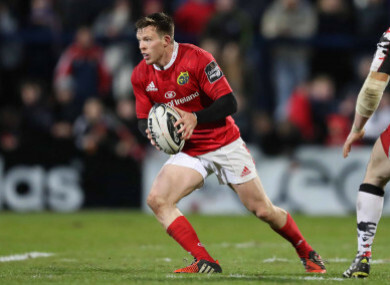 My first Munster start came in 2014 and the following January I signed a full contract and was thinking about all the matches still ahead of me. Sadly, by 2016 it was all over. I’ll obviously get into that in more detail over the coming weeks but, because of my injury, I was able to throw myself into my studies and complete a post graduate degree in Applied Sports and Exercise Nutrition. It’s something I was always interested in, my family would have always focused on fitness and I don’t take it for granted that I was incredibly lucky to work with some great coaches and experts in fitness and nutrition over the years. I launched my new business in January. I’m really enjoying it so far and I’m getting to work with some very interesting people. Calling what I do a business feels strange too, it never feels like work. Over the next 12 weeks I’m hoping to pass on my knowledge in areas from nutrition and muscle gain/fat loss in preseason to a more in-depth look at coping with injury and retirement at a young age. I’ll also be answering your questions at some stage, so if you’ve any nutrition or general fitness queries, make sure to stick them in the comments section below and I’ll get to them. Email “'Rugby wasn't always my first love, but when I knew... I knew'”. Feedback on “'Rugby wasn't always my first love, but when I knew... I knew'”.